Congratulations to our Level 3 Business students at Newtown College, who have won the Positive Pathways Powys Business Ideas Competition 2019. The competition required entrants to consider a business proposal which included detailing the target customers, type of promotions to undertake, staffing and the issues which may need to be overcome. From the contestants three groups were shortlisted and invited to present to a panel of judges at Powys County Council’s headquarters in Llandrindod Wells. A total of nine judges, which included County Councillors and local business managers then challenged the groups with questions on their business concepts. 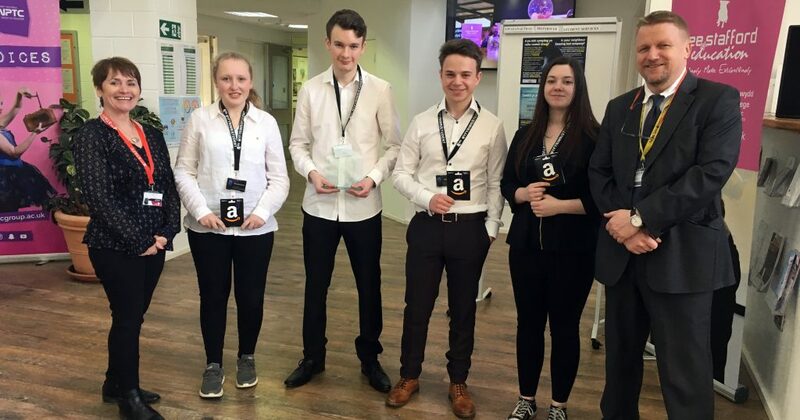 Newtown’s Business students, Brooke Jones, Ethan Smith, Rhys Gough and Zoe Morgan, presented a well thought through business proposal of smart home installations which grabbed the attention of the panellist of judges and won them a trophy and £200 of Amazon vouchers. The group were delighted with their win and hoped this was an opportunity to open doors for further development of their concept. The group are now due to meet the cabinet again to discuss further possibilities regarding their ideas.